We’ve also made the game completely free! Blowfish Meets Meteor is a brick-breaker. A year ago, when we launched on Apple’s iPhone and iPad, we were met with a lot of glowing reviews — and a fair bit of confusion. Amidst all the talk of the beautiful animation and the goofy sense of humor, there were an alarming number of reviews that threw around phrases like “typical” or “unremarkable.” A lot of people seemed to think it was a perfectly serviceable brick-breaker, and they stopped there. In hindsight, it’s hard to blame that assessment, because Blowfish Meets Meteor actively goes out of its way to pretend to be a normal brick-breaker for its first several levels. 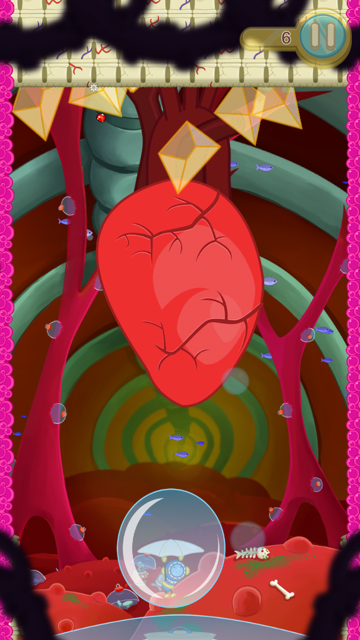 This was part of the subversion we based the game’s design on. It’s got all the classic brick-breaker trappings: a ball (in the form of a meteor), a paddle (in the form of an undersea diver), and a boatload of bricks to smash with them. The first level reinforces this: you’re mostly using the meteor to destroy blocks. It’s a chance to learn the basic controls and to get a feel for the game. 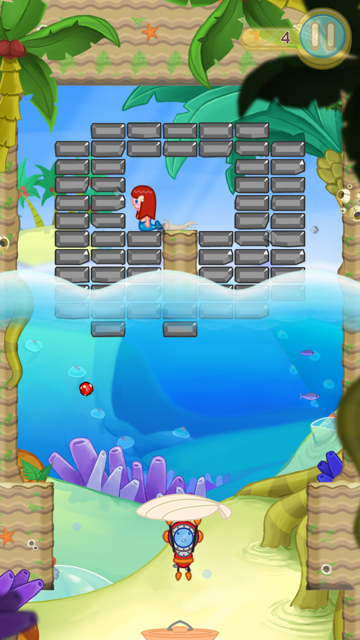 The level has no real defining features, and nothing that’s unique to the genre, except for a single tiny mermaid endlessly wandering back-and-forth inside a pocket of bricks. When the player destroys the bricks trapping her, she’ll wander further out, and when they’ve destroyed enough bricks that she can fall to the bottom of the screen, she’ll do so. This triggers the end of the level and a confetti-covered victory celebration while your diver, his mermaid wife, and the mermaid daughter that was just rescued jump up and down with glee. This was our first subtle hint that Blowfish Meets Meteor was built to subvert genre tropes. The next few levels play off of the mermaid theme: Level 2 gives you two mermaids to rescue before the level is won, and Level 3 gives you a powerup. So far, so typical — until Level 4, when the giant piranha shows up. This giant piranha sits idly in the middle of the screen, breathing heavily, sweating, and generally taking up a lot of space. He’s positioned smack-dab in the mermaid’s way, and if the player tries to rescue her before destroying him, he immediately gobbles her up on contact; the level ends with your characters sobbing uncontrollably as the mermaid daughter slides down the enemy’s throat. It’s clear that you have to take out the piranha before you can win, but smashing it with the meteor does nothing. This is the first time where the puzzle element comes into play, and Blowfish Meets Meteor starts genre-hopping. A couple levels previous, players were taught about a special TNT move, where destroying several bricks in rapid succession would grant them a sentient stick of TNT. 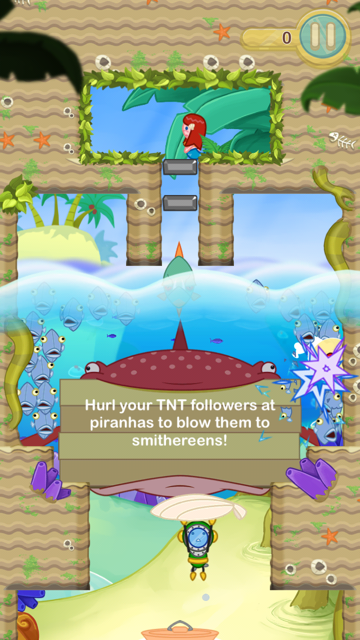 By tapping the screen, players can hurl this TNT anywhere they please, destroying everything in its path on contact. At its core, this mechanic is a get-out-of-jail-free card; nothing in the brick-breaker genre is more annoying than that point near the end of a level where only a few bricks are left, and you have to aim the ball at an incredibly precise angle to hit them. TNT sidesteps that problem by letting players destroy any brick they want simply by tapping on it. And so on, and so on. One of our biggest goals with Blowfish Meets Meteor was to never repeat a level design. 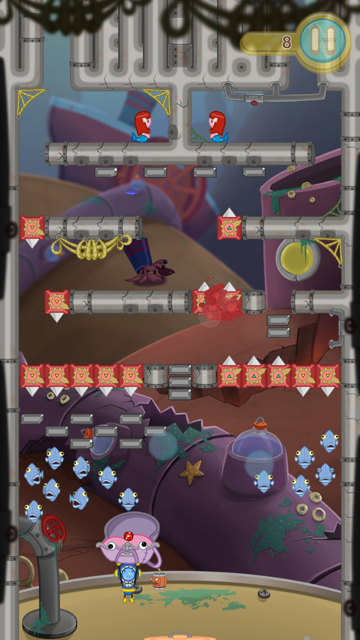 There are plenty of levels that still focus on brick-breaking, and those often get their own special mechanics, as well, like a series of late-game levels that include paddles on both the top and bottom of the level, or levels where there are no walls, and the ball wraps around the left and right edges of the screen. The end result was a game with 60 levels, all of which had a completely different hook. In the end, Blowfish Meets Meteor is a brick-breaker, but it’s also a puzzle game. When it feels like it, it brings in elements of platformers, shooters, and adventure games. In a nutshell, it takes inspiration from everywhere. We wanted to make a brick-breaker that took the genre in new and exciting directions, and, a year later, I’m still incredibly happy with the result. In a way, I think we tried to be too clever. I still love the idea of a game subverting expectations, surprising players, and slowly unfolding into something much different from what it initially presents itself as. At the time, though, I don’t think I understood the mobile game marketplace well enough to pull this off properly. In truth, we probably could have gotten away with this with Blowfish Meets Meteor if we had simply marketed it as a brick-breaker first and foremost. In our haste to demonstrate how much more was on offer, but also to not give too much away, we muddled the message: sometimes, it was a brick-breaker, sometimes, an action game, sometimes, a puzzle game. In practice, this meant that the game didn’t get a very hard push in any one direction. Our App Store rankings revealed that it showed up in puzzle searches far more often than it did in brick-breaker-related ones. At present, Blowfish Meets Meteor shows up at number 67 in an App Store search for “brick breaker” — far beyond the point where most people will stop browsing. So we never quite hooked the brick-breaker audience. I suspect we also didn’t quite hook the action or puzzle audiences: most of the “typical brick-breaker” reviews suggest players that bought the game expecting something that immediately identified as one genre or the other. Subversive game design certainly has its place. I still think it’s clever. I think it’s fun. I think it rewards players who take the time to look beyond the thirty-second hook. If I were to do it all over again, though, I’d leave it out of my marketing. With any successful marketing campaign, there’s a singular core: what is this product I’m selling, and who am I selling it to? Having had a year to digest it, I think Blowfish Meets Meteor is, first and foremost, a brick-breaker, and it should’ve been marketed as such. The action elements, the puzzle elements, and the subversion have their place, but it’s hard to hang your hat on “my product goes above and beyond” as a marketing message, because everyone is trying to do that, and people are used to tuning it out. Find the core, and target them with everything you’ve got. 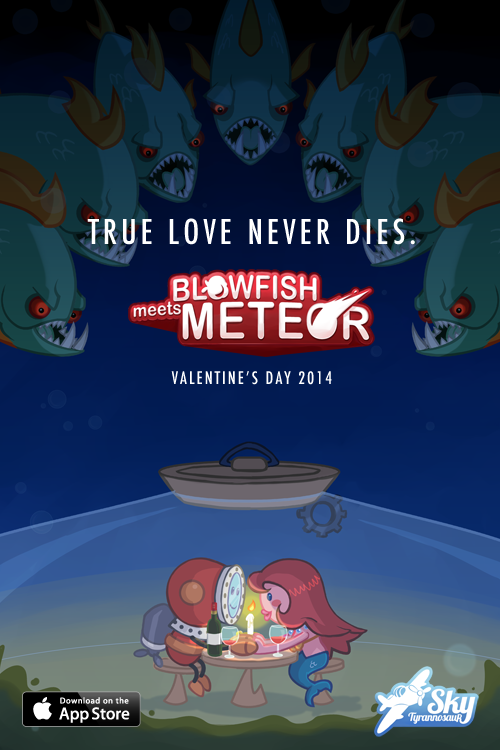 Blowfish Meets Meteor is Available Now For iPad! Blowfish Meets Meteor is now available natively for iPad, and it comes with a host of new improvements! 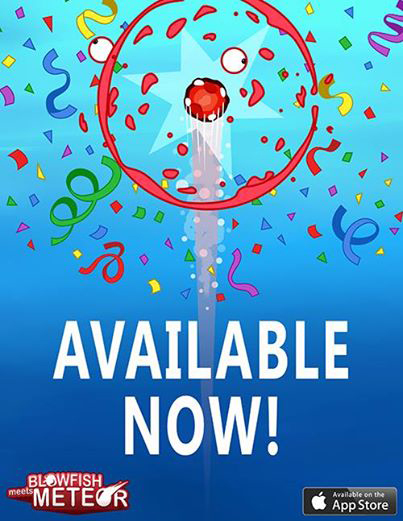 Blowfish Meets Meteor Launches Today! After three long years, Blowfish Meets Meteor has finally launched! It’s an incredible feeling — equal parts excitement and anxiety. Waking up and finding positive reviews trickling onto the interwebs is amazing and surreal all at once. Having spent so long locked in a room making this thing, it suddenly seems strange that other people are playing it. I imagine this is what it feels like when your child goes off to school for the first time; you nurtured them as much as you could, for as long as you could, but now they’ll be exposed to the world at large. And that’s great! And terrifying. You can download the game here. Please do — and be sure to let us know what you think! It’s been an incredibly long haul, but the end is in sight and Blowfish Meets Meteor is nearly upon us. Today, we’re incredibly excited to give you an exclusive chance to be a part of our beta program and play the game before anyone else.